The man from the bicycle shop was standing at the street corner waiting for the lights to change, when he saw us waving energetically in his direction. He was clearly puzzled by our outbursts of greeting, but nonetheless smiled broadly and waved back enthusiastically, arms flapping in the air. We had actually been waving to friends walking a fair distance behind him who had not noticed our presence across the street. Soon enough the traffic lights changed, the misunderstanding was relayed amid much laughter and I knew we had come to the right place for a weekend of unwinding and fun. The seven of us, former high school classmates from Tokyo, were in Hotaka town, in Azumino, a picturesque region at the foot of Japan’s northern Alps, to soak in the soothing waters of the area’s hot spring baths, indulge in wholesome comfort food and take a break from the hustle and bustle of city life. The friendliness and easy-going spirit of the local people, such as the man from the bicycle shop, was an unexpected bonanza. 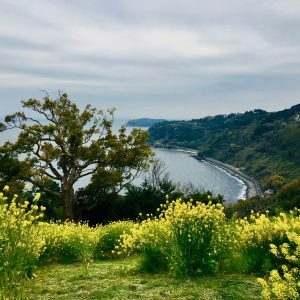 Azumino, which is a popular base for climbing the surrounding mountains, had been a random choice, made on the basis of its relative ease of access and most importantly, the hot spring baths, for which the area is famous. 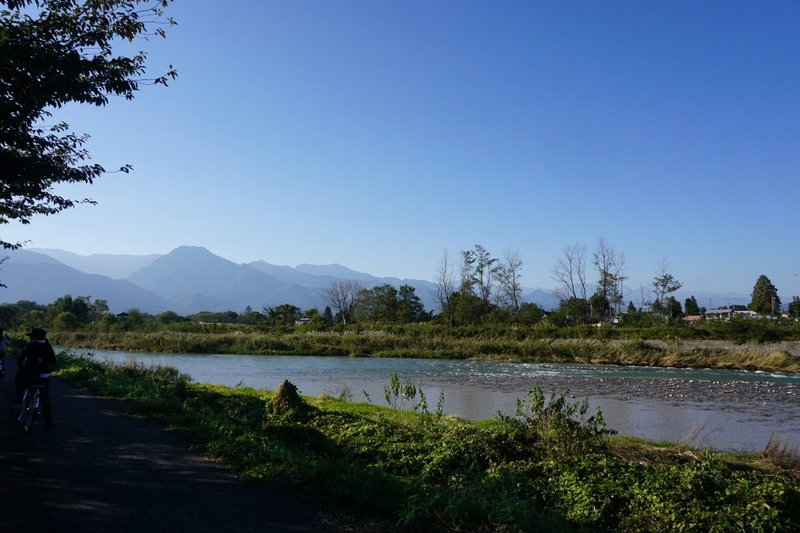 Not being mountain climbers, we rented bicycles instead and headed to the Daio Wasabi Farm, a short ride from the station. Wasabi, which grows along spring beds under natural forest canopies, needs plenty of moisture in the air and well-draining soil to thrive. 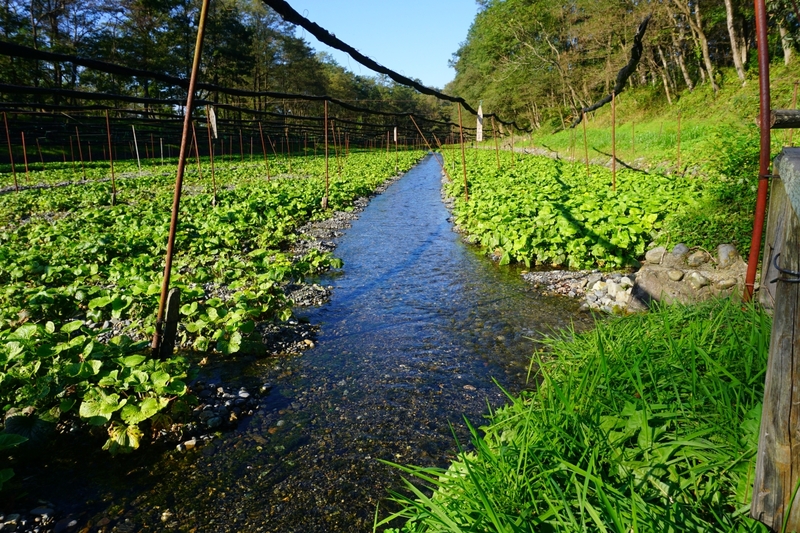 Azumino is one of Japan’s main wasabi-producing regions and Daio Wasabi Farm is the country’s largest wasabi farm, with an annual yield of 150 tons. While all parts of the wasabi plant are eaten in one form or another, it is the stem of wasabi, which is grated into a green paste and used to add a strong pungency to dishes such as sushi and soba noodles, that is most in demand. 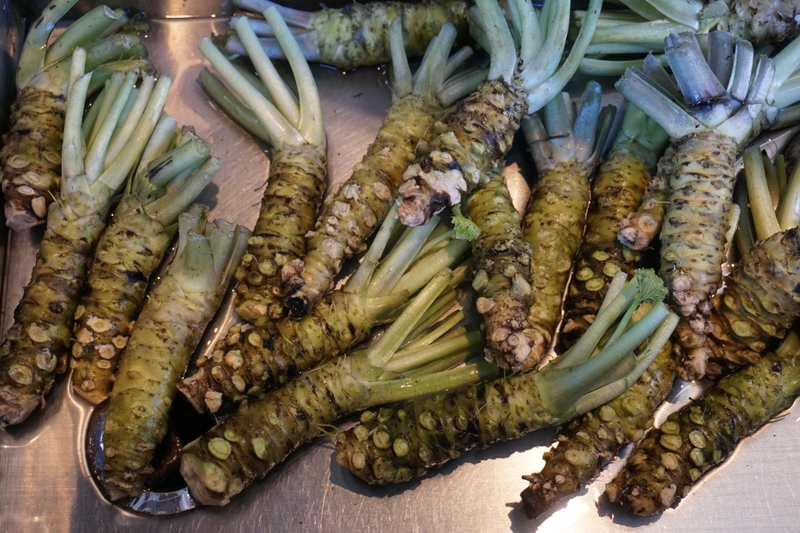 The wasabi stems sold at Daio Wasabi Farm are thick, long and fresh. The problem is, although wasabi grows naturally along stream beds in Japan’s mountain river valleys, it is prone to disease when cultivated on a large scale. 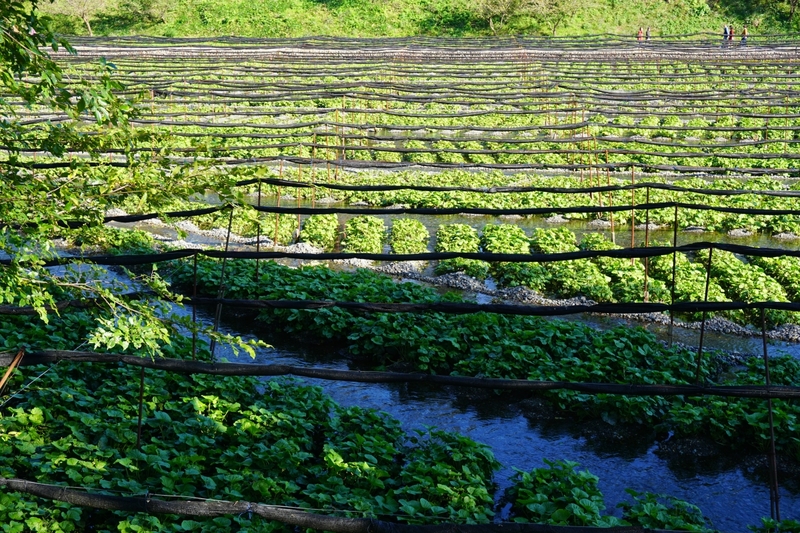 The challenges of wasabi farming have given it a reputation for being the most difficult plant to grow commercially. This all makes the Daio Wasabi Farm a truly impressive enterprise. 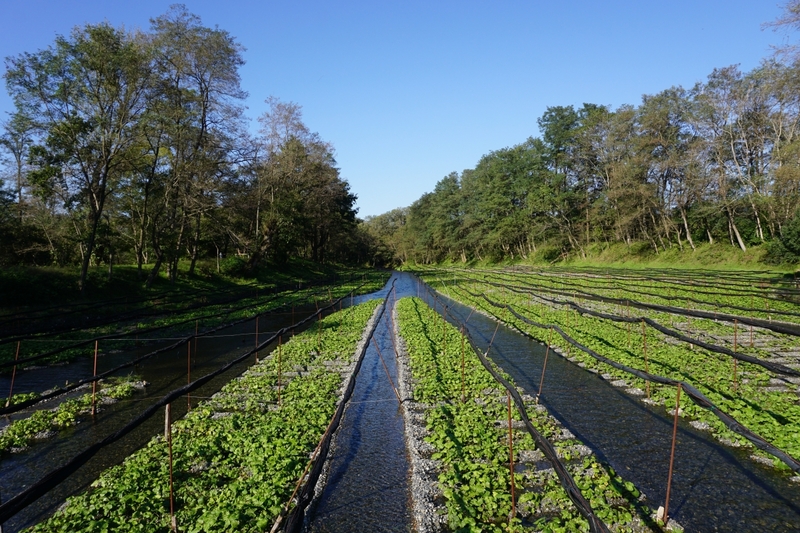 We were fortunate to visit the farm on one of the most beautiful, clear sunny days in October and be greeted by rows and rows of wasabi plants, shining a luminous green under a cerulean sky. The water temperature is kept at 13 degrees centigrade all year round. 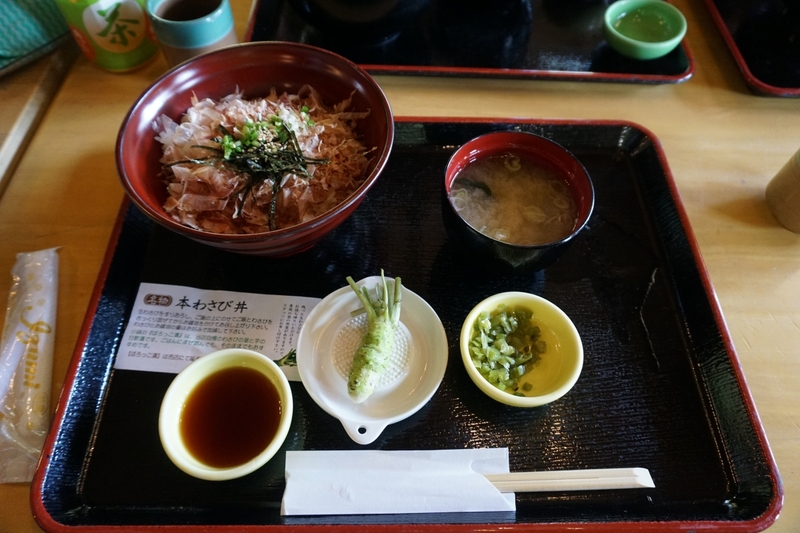 But before exploring the farm grounds, we made a beeline for the restaurant to try the wasabi-don, or rice bowl topped with grated wasabi and katsuobushi, or dried bonito shavings. The wasabi-don comes with a large wasabi stem (center), which is grated just before being added to the bowl of rice, katsuobushi (dried bonito shavings), shredded nori (dried seaweed) and chopped spring onion (top left). Wasabi should be grated just before eating to maintain its sweet and pungent flavor. Although the idea of eating rice with just wasabi and katsuobushi struck us as a little peculiar (what? no significant protein?) most of us opted for the combination meal of wasabi-don and wasabi soba. The wasabi-don was surprisingly good. But satiated after consuming all those carbs, I decided to skip the wasabi soft-serve ice cream my companions had for dessert. It was, they reported, sweet rather than pungent. 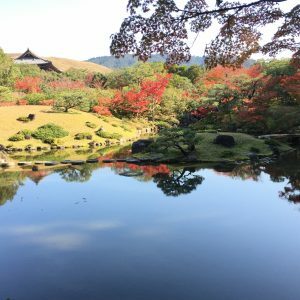 For the next hour or so we walked through the grounds of the wasabi farm, enjoying the mild autumn weather and the restful green and blue color palette of the surrounding scenery. 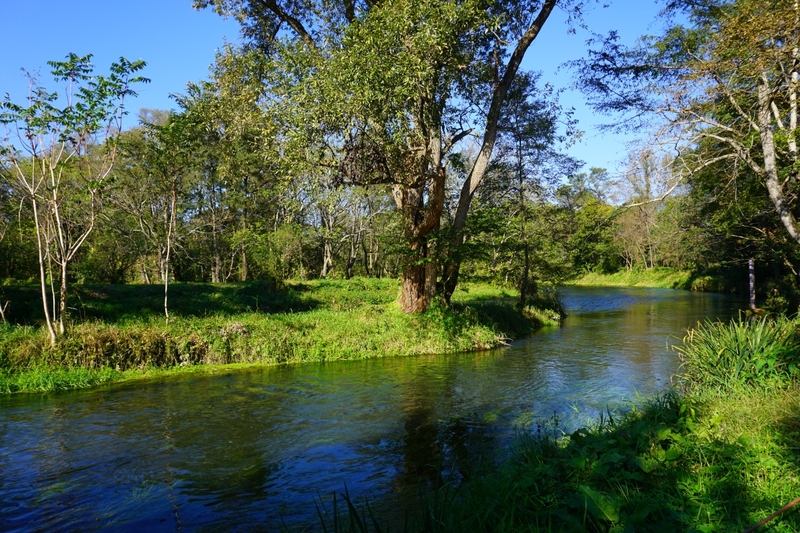 A river runs through the wasabi farm grounds. The only thing that broke the magical spell of the place was the incongruous sight of shockingly red inflatable boats carrying tourists clad in brightly colored life vests up and down a short section of one of the waterways. This remarkably clear water springs from the ground 6 months after snow falls on Japan’s northern Alps. We then headed back by bicycle to the station where, having returned our bikes, we had our humorous waving exchange with one of the bicycle shop attendants. The front entrance of Oyado Nagomino. 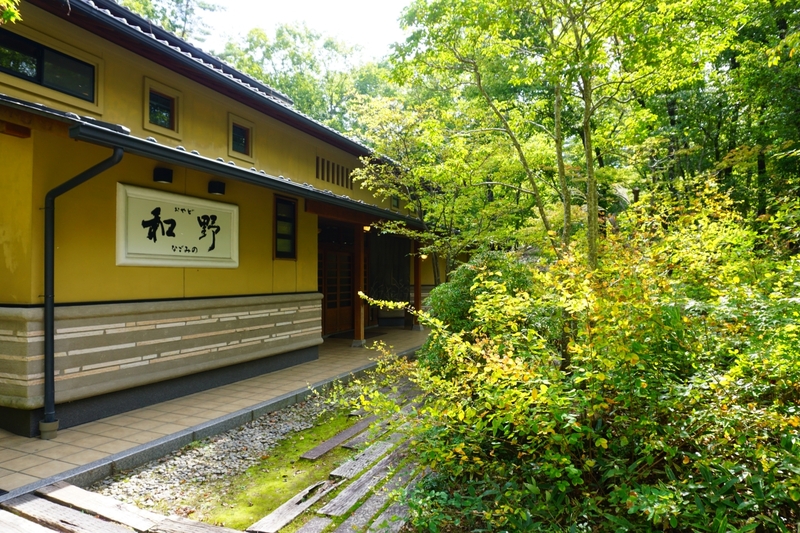 Once settled into our rooms, we lost no time in heading to the onsen (hot spring) baths. To our dismay, the bathroom and bath tub were both too small to accommodate more than 4 people at a time — a distinct inconvenience for our group of 7. In addition, we were hardly the only guests staying at the hotel. Still, the hot spring water was soothing to the skin, and we soon forgot the inconvenience, particularly after we sat down for a sumptuous Japanese dinner of seasonal dishes and local sake (rice wine). Everyone expressed alarm at the amount of food we managed to eat. 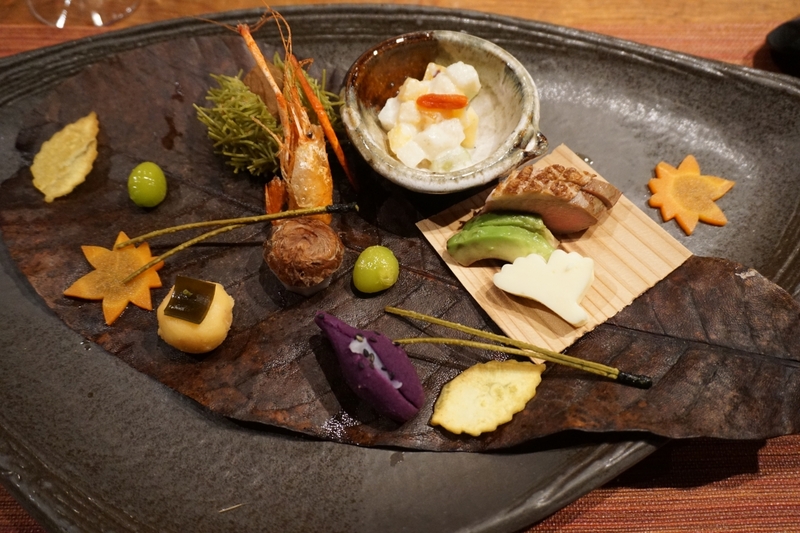 The autumn-themed appetizer at Oyado Nagomino. 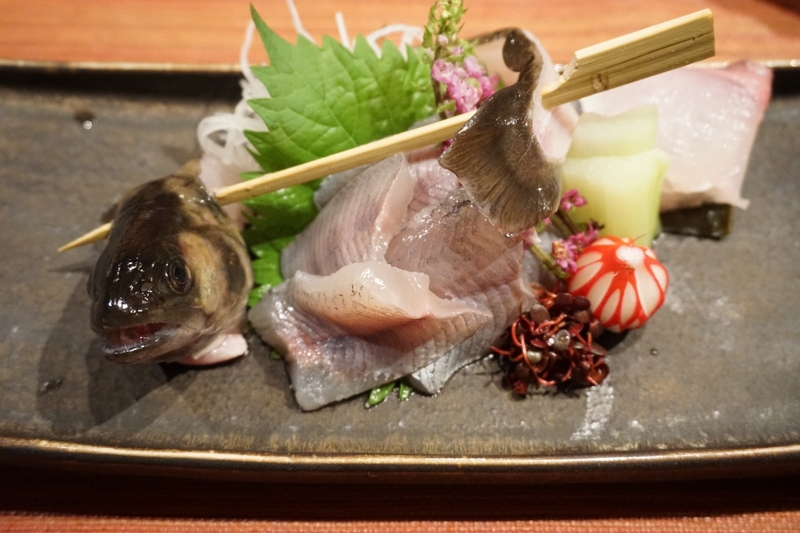 The sashimi was iwana (Japanese char), a river fish, which is usually served grilled rather than raw. The next morning, however, we found ourselves inexplicably hungry again. After another delicious meal – this time of tofu with wasabi, grilled fish, grated taro and other local specialties — we headed out for a short walk to the nearby footbath. 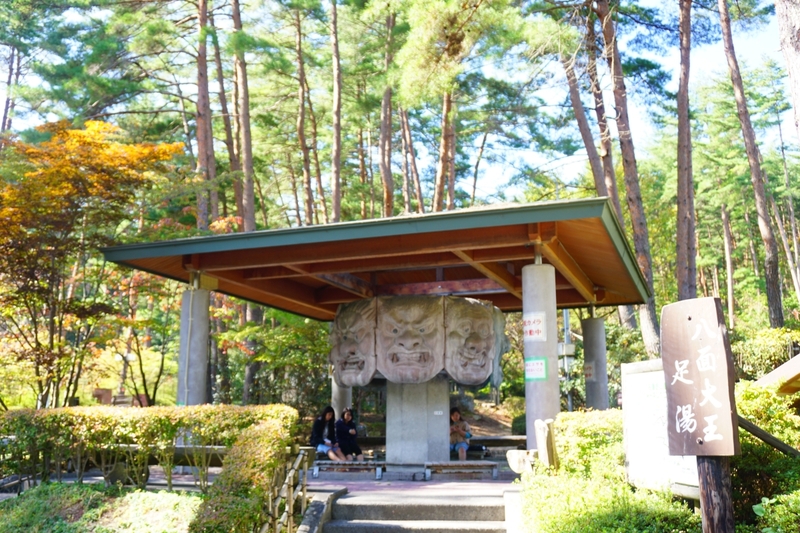 The foot bath guarded by the Hachimen Daio, or eight-headed great king, is free. Our last stop in Azumino was a market where we sampled some local wine and apples at the outdoor stalls, loaded up on locally made miso paste and wasabi, and ate a seasonal specialty – shin-soba noodles made of newly harvested buckwheat flour – for lunch. When we arrived at the station for our return trip to Tokyo, the chatty taxi driver who delivered us there gathered us around him, pointed to one of the peaks and encouraged us to return to climb Mt Hotakadake. Hotaka town, in Azumino, is surrounded by Japan’s northern Alps. 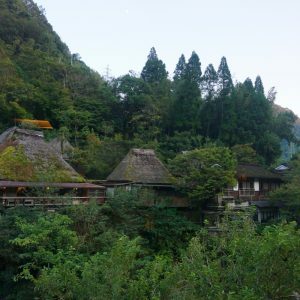 I’m not sure about climbing that 3,190-meter high mountain, but I am already plotting a return to Azumino for its stunning scenery, nourishing food and friendly vibe. From Tokyo’s Shinjuku station, take the JR Chuo Honsen express to Matsumoto (about two and a half hours). At Matsumoto, transfer to the JR Oito line to Hotaka (about half an hour). Oyado Nagomino is a 10-minute taxi ride from Hotaka station. The hotel also runs a shuttle to and from the station. Open all year round from 9:00 to 17:20 (March-October) and from 9:00 to 16:30 (November-February) free of charge. Access : ten minutes by taxi or 15 minutes by bicycle from Hotaka station. Depending on the season, day of the week and number of people staying in a room, rates range from Y17,280 to Y21,600 per person including dinner and breakfast. There are several bicycle rental shops near Hotaka station. Shinano-an, where we rented bicycles, rents regular bikes for Y200/hour and electric bikes for Y300/hour. They will keep your luggage there for free while you cycle.